The International Game Fish Association (IGFA) today announced the kick-off of a site selection process to identify a new headquarters location in South Florida. The process includes plans to sell IGFA’s property in Dania Beach, Fla., which housed the IGFA Fishing Hall of Fame and Museum from 1999 until its relocation in 2015. Since its establishment in 1939 as the world’s governing body for sport fishing, the IGFA has had several headquarters locations, beginning with its original offices at the American Museum of Natural History in New York City. The association moved to the Alfred I. DuPont Building in Miami in the late 1950s, then relocated to Las Olas Boulevard in Ft. Lauderdale in 1967, followed by a move to Pompano Beach in 1992. 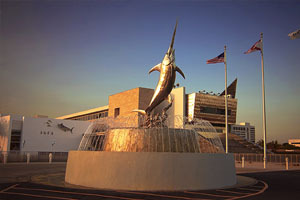 The IGFA moved to its present location in Dania Beach in 1999 when it opened the IGFA Fishing Hall of Fame and Museum. IGFA Chairman Duncan, Treasurer Roy W. Cronacher Jr. and President Horton will lead the process to identify a new headquarters location and negotiate a successful sale of the IGFA property with ongoing legal counsel from Brendan Aloysius Barry, Esq., of Shutts & Bowen LLP. Horton added that an optimal future headquarters location would include executive office space for approximately 20-25 employees; ample display and archival space for the E.K. Harry Library of Fishes, which is the world’s most comprehensive collection of angling literature, art and artifacts; and a waterfront location to support IGFA’s long-standing youth education programs focused on developing future generations of ethical, conservation-minded recreational anglers. The IGFA is currently located in a three-story building of nearly 60,000 square feet in the Sportsman’s Park development. The majority of the building space is on the 40,000-square-foot first floor, which formerly housed the IGFA Fishing Hall of Fame and Museum. The third floor currently houses the IGFA executive offices and the second floor is home to the E.K. Harry Library of Fishes. Set in a prime location near the new Dania Pointe development, the building is constructed of top quality materials capable of withstanding catastrophic storm winds and equipped with sophisticated security and electronics. The site also includes ample parking and an elevated boardwalk set around a wetland of Florida flora and fauna zones. The facility is situated adjacent to Interstate 95 just minutes from the Florida Turnpike and directly adjacent to a Metro Station within a two minute walk. The Fort Lauderdale-Hollywood International Airport is just 3.5 miles away. Parties interested in proposing future location sites for the IGFA should send written proposals to [email protected] The association will not respond to telephone solicitations or in-person visits without first receiving written proposals at the above e-mail address.